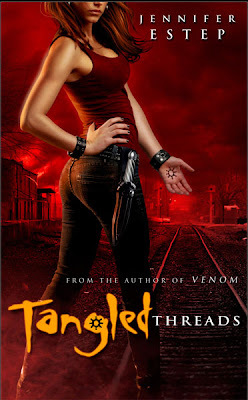 It seems like just yesterday Jennifer Estep's Spiders Bite, the first book in the Elemental Assassins series was released and today she posted the preliminary cover for the FOURTH book in the series, Tangled Threads. I love the title. The book releases April 26, 2011. The cover art is fantastic!! Dottie I figure I won't catch up until I retire. LOL. Jennifer has a terrific set of covers for her series. Hmm, she's looking very Jennifer Love Hewitt for some reason. LOL, can't explain it, that was my first impression. Good thing she's awesome!